New England food comes in many forms, and Brooke Dojny has included them all in the newly revised edition of “New England Home Cooking.” The book is a true pleasure to peruse – not just for its wealth of over 350 recipes, but the back story and detail given to each dish. I am always interested in the story behind the recipe, and clearly, so is Dojny. In addition to the “classic” New England dishes like Rhode Island Red Chowder, Maple Baked Beans, and Steamed Boston Brown Bread, special attention is paid to the regional ethnic dishes that cover New England like a delicious patchwork quilt. 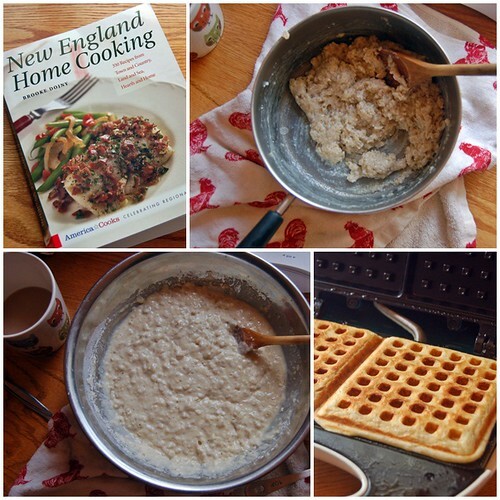 Dishes like Portuguese Sweet Bread in Martha’s Vineyard, Hungarian Egg Dumplings in Fairfield, Connecticut, and the recipe I chose to make for my Saturday morning breakfast this weekend – Scottish Oat Waffles. 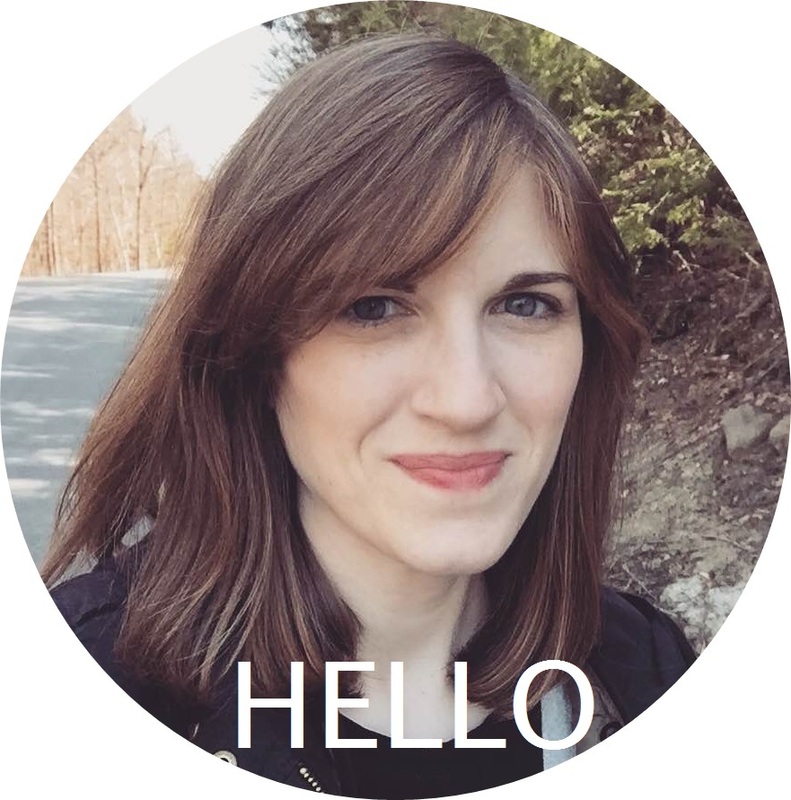 Thanks to my 6-month stint in Edinburgh in 2004, I am sentimentally partial to anything Scottish (even haggis), so I was delighted to learn that there is a large and thriving Scottish population in northern Vermont. The area around Barre attracted Scottish immigrants with work in its granite quarries, and they brought with them the Scottish love for all things oatmeal. A thick oatmeal is generously buttered and added to a batter enhanced with the tang of buttermilk. I picked up my tiny waffle iron for $2.98 on the clearance shelf at Target. I think it was part of the avalanche of “dorm essentials” they try to get rid of at the end of September. 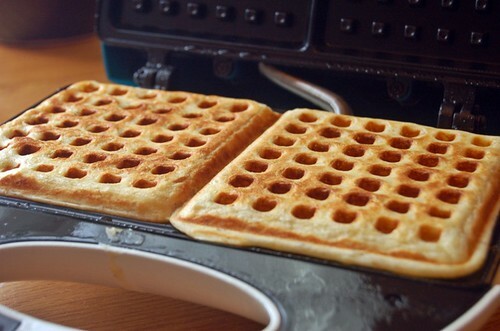 After a few minutes in the waffle iron they come out crispy, hot, and ready for butter and syrup. Lots and lots of butter and syrup. Because I wanted to use up all of the batter before eating, I put the waffles on a wire rack after they came off the iron. That way they didn’t get soggy from the steam. When it was time to eat, I just popped a few in the toaster for a minute to heat them up and add a touch of crispness. 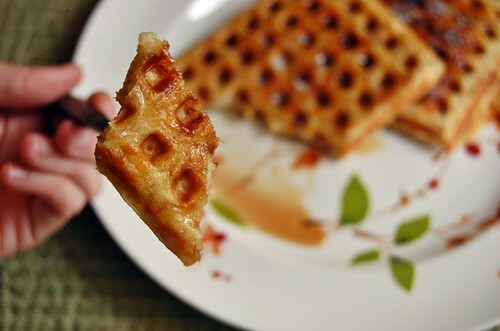 Homemade waffles feel like an extra treat, because you need to invest in that bonus step of a waffle iron to have them at home, but you’re rewarded with pooling squares of pure maple syrup and melted butter. These waffles were very tasty. The oats lended a hearty texture just right for a morning meal. I only wish I had thought to put some fruit on top. This recipe, and many others, are overflowing in “New England Home Cooking” – I know I will be referring to it again for both inspiration and instruction. Thank you to the fine folks over at the Harvard Common Press for sending me a copy to enjoy! The book was complimentary, but of course, my opinions are my own. Combine the oats and water in a medium-sized saucepan. Bring to a boil, then lower heat and simmer, uncovered for 5 minutes, whisking often. Oatmeal will be very thick. Remove from heat and add the butter, whisking until the butter melts. Set aside. In another bowl, whisk together the buttermilk and eggs, then whisk the egg mixture into the oatmeal mixture. Add the oatmeal mixture to the flour mixture, and stir until just combined. Spray the pre-heated waffle iron with non-stick cooking spray, then spoon the waffle batter into the center of the waffle iron, smoothing to almost the edge with the spoon. Close the lid and cook until steam stops rising or a light indicates doneness. For me this took around 5 minutes. Repeat with the remaining batter, then serve waffles hot with plenty of pure maple syrup. 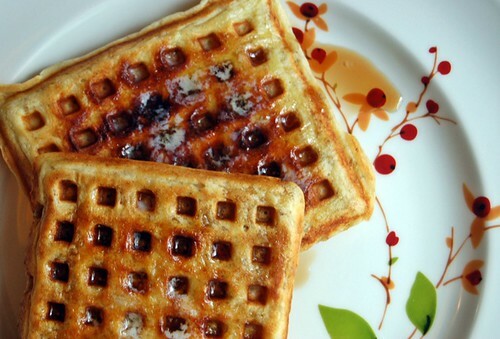 The waffles sound amazing and I love that you got a waffle iron for less than $3! What a bargain. Isn’t Target the best? I keep wondering when Vermont is ever gonna get on the Target band wagon. Probably never. I’m also obsessed with all things Scotland/Edinburgh, so very excited for this recipe. The whole cookbook sounds fantastic, I should check it out. And…very glad to see your awesome purchase in use!